Fredi Gonzalez was the field manager for the 1992 Sailors team. 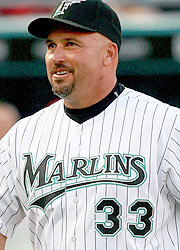 Fredi spent six seasons in the Yankees organization as a player, and gained his first professional managerial experience with the Miami Miracle in 1990. A Marlins coach from 1991-2001, Gonzalez managed Richmond and was a base coach for the Atlanta Braves until 2006. Fredi is currently manager of the Florida Marlins.